Osaka Toin High School had plenty to celebrate this year, having become just the seventh school in history to complete a double of the spring and summer national baseball championships at venerable Koshien Stadium. But what made Osaka Toin's triumphs even more newsworthy was that they both came against the same team, Aomori Prefecture's Kosei Gakuin. That marked the first time in history that the final of the summer national championship was a rematch of the one in the invitational tournament, held in April. Osaka Toin's victories also denied the Tohoku region a first-ever national crown in 10 trips to the final, including the last three in a row by Kosei Gakuin. 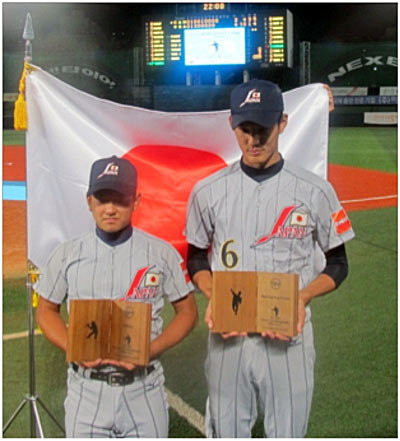 Osaka Toin's lanky ace Shintaro Fujinami, whose fastball has been clocked at over 150 kph, threw a two-hit shutout and struck out 14 in a 3-0 victory in the summer final. So it was no surprise that Osaka Toin's feats made the final cut of candidates for Top 10 stories of 2012. Unfortunately, given that this was an Olympic year that always produces a large number of top stories, it did not make the top 10. Meanwhile, Koshien has not seen the last of Fujinami. He later became the No. 1 draft pick of the Hanshin Tigers--whose home stadium is Koshien--after the Central League team won out in a lottery for him with three other teams.